Yfanwen (pronounced "if-an'-when") is a comfortable, very private and pet-friendly, fully equipped and serviced standard Lockwood family home of 100 square metres (1000 square feet). It is complete with Wi-Fi, heat pump and MY SKY PLUS TV, including the movie and sports channels. It sleeps 6 comfortably and can accommodate 2 more on a bed-settee. It is the alternative home of Margaret and Tim, the owners . We are in the community of Okiato just across the water by car ferry from Opua, close to the Far North town of Russell in New Zealand's picturesque Bay of Islands. Opua is off State Highway 1 about 220 kilometres north of Auckland. The Russell Peninsula is part of a 'Land Island' nature reserve - listen to the kiwis calling at night, and pukakos and tuis around you in the surrounding bush when you are staying in Yfanwen. Yfanwen is built back from a low cliff and adjacent to tranquil Pipiroa Bay. The house overlooks the Veronica Channel with views to the west and north as far as Paihia and Waitangi. 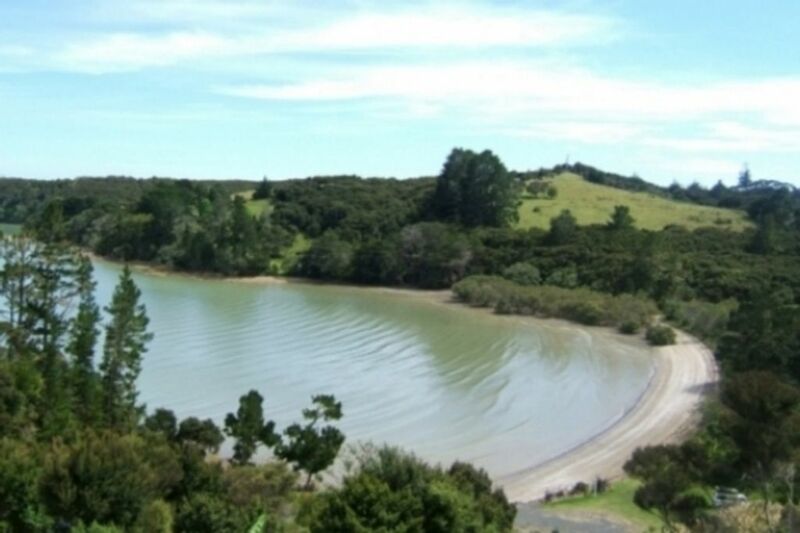 The property is beachfront with 4.5 hectares (over 18 acres) of low hills and pasture, footpaths and two adjacent shallow, safe swimming beaches. The home is in its own bush environment, is private and is safe for small children under supervision and is in general ideal for a family holiday. Pets are welcome at Yfanwen. Our walk-out (an alternative to using the car) is a bush pathway under the tree canopy leading for nearly 2 kilometres to Aucks Road, the main road between the Opua car ferry ramp and Russell. The photo gallery tells you all about the house, the views and how to find us. Well appointed, self contained Lockwood home with Wi-Fi, MY SKY PLUS and a heat pump. Stunning views, gorgeous location. Comfortable and cosy lockwood house. Amazing location, perfect for 4 active boys, and fantastic that we could bring our dogs with us. Property was exactly as advertised. Highly recommend this as a place to stay. This is a fantastic and traditional kiwi Bach with great views, privacy, birds, rabbits and everything you need for a great holiday. We had a great holiday and a real bonus being able to have our dogs with us. We would definitely book again???? We love the location of the bach - very private and peaceful with a nice view. Fantastic for our kids and dog. Nice batch . Loved the location , and the kids had so much fun with the kayaks . Very relaxing and beautiful . Don't know where the BBQ went , that was missing . We would love to go back .